(BusinessDesk) – An $8.5 million research grant awarded to crown research institute Plant & Food this week for new breeding technologies for high value plant industries includes gene editing which is considered in New Zealand to be part of genetic modification. The grant was part of the total investment announced this week of more than $209 million over the next five years in new scientific research projects through the Ministry of Business, Innovation and Employment (MBIE) 2016 Endeavour Fund. Plant & Food chief executive Peter Landon-Lane told the NZBio conference today that one of the new breeding technologies is CRISPR gene editing, which gives biologists the ability to target and study particular DNA sequences in the expanse of a genome and then edit them. . .
Large scale dryers such as this play a key role in driving value for the business, says Fonterra’s Chief Operating Officer Robert Spurway. . . Entering the Greater Wellington Ballance Farm Environment Awards was a valuable exercise for South Wairarapa viticulture business, Palliser Estate Wines of Martinborough Ltd.
Chief executive officer Pip Goodwin says the operation aims to be a leader in the production of high quality wine using the most sustainable methods possible. When Scion, the Crown Research Institute that specialises in science around forestry, wood products and bio materials, learned the level of formaldehyde emissions from wood panels were being regulated lower in countries like Japan, the United States and in the European Union, with New Zealand following suit, it looked to biotechnology to find ways of reducing the emissions. . .
From ‘farming is easy’ to ‘farmers are rich,’ there are a million things consumers think they know about farmers. We asked our amazing farm community what the one thing they wish people knew about farmers. These are the responses. Farmers are smart! They have to be everything – plumbers, carpenters, mechanics, scientists, vets and more. Every day! Farming is a lifestyle, not a job. It’s 24 hours a day, 7 days a week. Every day of the year. It’s almost impossible to take a vacation, especially if you have animals. Some farmers have to have jobs off the farm to make ends meet, but they still wouldn’t trade it for anything. . .
Industry safety champions in both New Zealand and Australia have come forward to show their safety leadership by becoming Principal Partners to the 3rd FIEA Forest Industry Safety Summit conference series – scheduled for March 2017 in Rotorua and Melbourne. “The leaders of both McFall Fuel in New Zealand and VicForests in Australia see their teams as early adopters of positive safety practices. So they’re keen to show leadership for others in the forest industries by being proactive in safety,” says event director John Stulen from FIEA. McFall Fuel CEO, Sheryl Dawson actively promotes safety in every aspect of their company’s operations. McFall Fuel’s strong family values of zero harm, respect, trust, integrity, teamwork and a strong work ethic are reflected in every facet of the work carried out. . .
Tony Walters is farming’s ambassador of technology, writes Gerald Piddock. Dairy farmers could soon be using wireless technology as proof that they are operating an environmentally sustainable operation. The wireless connection could help sell the New Zealand story to overseas customers resulting in better prices for their products in the market. For farmers, that would mean they get paid better for their milk. Tony Walters is convinced the day will come soon when this works and is piloting the technology on his 95 hectare dairy farm at Waiuku in North Waikato. . . Using charged iron to capture tiny particles worth hundreds of dollars a kilo, creating technology to speed up nature more than 300 fold and real-time composition analysis with the potential to revolutionise a multi-billion dollar industry. These may sound like scenarios borne out of a NASA testing facility, but in fact these space-age innovations have origins right here in New Zealand – part of Fonterra’s asset optimisation programme that’s helped position the Co-operative as a global leader in dairy R&D. Fonterra Chief Operating Officer Global Operations Robert Spurway says R&D is one of the most important factors shaping the dairy industry today, particularly when it comes to selling our capabilities with new and existing customers around the world. 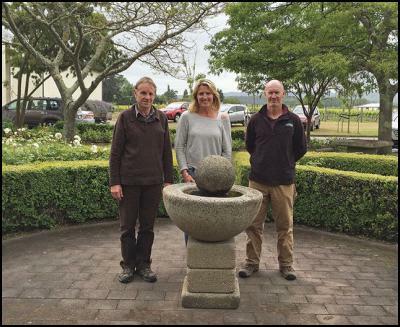 . .
Nearly 200 groundspreaders from across the country will, next week, gather in Nelson for the 60th Annual Conference of long-standing trade organisation – the New Zealand Groundspread Fertilisers’ Association (NZGFA). Conference attendees – ground spreaders, suppliers, trainers, auditors and testers – will hear from key speakers including Hon. Damien O’Connor (West Coast MP and Labour’s Spokesperson for Primary Industries), Mark Wynne, CEO of Ballance Agri- Nutrients, Mike Whitty, General Manager Marketing of Ravensdown Fertiliser Cooperative and Nelson forestry contractor and health and safety pioneer, Dale Ewers. “Health and safety and accident prevention are high on our agenda this year,” explains Brent Scully, NZGFA President. “Fertiliser spreading is a demanding job involving heavy plant, complex equipment and often steep terrain. Machine operators and spreader drivers undergo intense training; however, errors do occur and accidents do happen. We want to do everything we can to minimise risk for the men and women in this industry.” . .
Primary Industries Minister Nathan Guy has decided for sustainability reasons to close part of the Southern Scallop Fishery (SCA7), which covers the top and northwest coast of the South Island, for the coming season. The measures will prohibit commercial and recreational fishing for scallops in all of the Marlborough Sounds and part of Eastern Tasman Bay for the coming season, ending on 14 February 2017. “The strong message from the scientific evidence, as well as public submissions is the need to take the next step and close parts of the fishery to let it recover. . . Dairy farmers in the thick of calving are being offered thousands of dollars for their best bull calves by CRV Ambreed. The company is offering farmers who breed the best bull calves $4,000 if their bull calves are selected for the CRV Progeny Test program. That $4,000 could turn into $11,000 from graduation payments or more if royalty options are taken. CRV Breeding Program Manager Aaron Parker said with calving now underway, a lucrative source of extra income could be dropping in farm paddocks across the country right now. As well as being welcome income for dairy farmers, delivering their best bulls to CRV Ambreed will contribute to genetic diversity, and thus advancement, across the national herd. . .
Luggate local Hunter Morrow has quacked his way to the US for the world championships in duck calling after taking out the national competition in Tauranga. More than 20 duck callers from around New Zealand took part in the quack-off on Saturday, where they had 60 seconds to blow a greeting, pleading and feed call – plus a lonesome hen call. Mr Morrow, a building apprentice, came 5th in the world champs last year. Fish & Game says he told reporters duck calling had been a “weird obsession” since he was a young boy. . .
Congratulations to Jordan Hogg from Seresin for winning Marlborough Young Winemaker 2016. The competition took place on 8 July at MRC in Blenheim where six contestants spent the day battling it out across various activities. Hogg scored very strongly across the board showing a great degree of knowledge and professionalism. Congratulations also goes to Matt Fox from Hyland Viticulture who placed second and Shelley Young from Delegat who came third. . . Farmers of the Central and Western North Island are to benefit from a $30 million Ravensdown investment in a new fertiliser storage and blending facility in New Plymouth. The 14,000 square metre facility adjacent to Ravensdown’s existing store will allow better customer service and better environmental performance according to the farmer-owned co-operative. “The agri-sector in the Taranaki is feeling the pinch and service towns like New Plymouth are seeing the impact. This investment has spin-off benefits for local contractors and shows Ravensdown’s commitment to the community and to its North Island customers,” said Mike Davey, Regional Manager. . .